After the dullest British summer in living memory, I begin to understand why landscape painters often used titles to describe the weather or to make excuses for light conditions. It suggests that these might not have been entirely natural or believable, or that they were contrived for theatrical effect. Turner and others added epithets such as “sunrise after a blustery night” or “thunderstorm approaching at sunset”. Weather is always at the forefront in Britain; never to be taken for granted, frequently surprising and often hostile. We keep a close eye on it and we discuss it freely with complete strangers. ‘Fire & Light’ is the title of my forthcoming show in New York which opens on the 13th of September. This title describes less the conditions in which the subjects find themselves, and more the elements of which they are made up, a true description far from the purely geographic label, and a hint of what the painting is really about. Washington Arch, here, could well support the title “Late Sunlight reflecting off Glass Towerblocks” because that is indeed the case. When looking at a painting we think we need to be told what the subject is, even though in this case George Washington is clearly recognisable there on the plinth, and the Stars & Stripes is a clue. 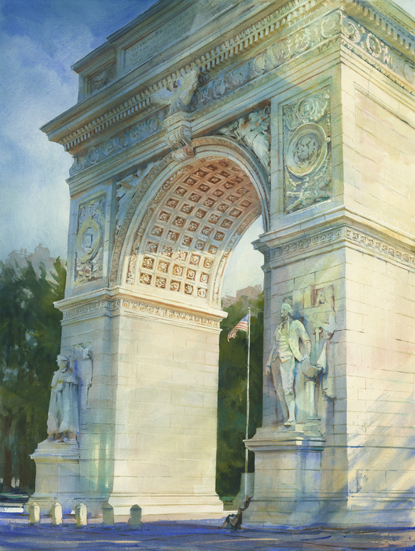 The fact that it’s an arch, in reverence to the triumphal precedent of ancient Rome, is also fairly obvious. The title becomes a distraction to the nub of the painting, which is the interplay of light on surfaces. Also in this exhibition I have a sequence of paintings of Rome, details of ancient stonework, highly refined designs carved by craftsmen, eroded by centuries and animated momentarily by fleeting effects of light today. These are glimpses which I have chosen deliberately, and at times waited for expectantly at particular times of day, returning again and again to get the moment right. Some I had journeyed specifically to witness and to paint, as seen in a series inspired by a firework display over Venice, part of the annual Festival of the Redeemer – Il Redentore. It matters not when the festival takes place, nor indeed that it’s Venice; what these paintings are about is the extraordinary explosions of light generated by artifice and the effects on the architecture and water below. These works have the titles of “Sound Study 1” or “Nocturne 3”. No need for anything more. They are not about geography. On a recent expedition to the north of England I was anxious to set eyes on those subjects depicted by Cotman, Girtin and Turner – the “rough-hewn matter” of sublime landscape which is now bypassed on the motorways. We enjoyed places with names like Snake Pass, Gordale Scar, Hardraw Force, Dunstanburgh, all painted by Turner, Girtin and others. What impressed me was the monumentality of it all: ruined castles, gorges, waterfalls, and dramatic weather and light, not the names. Of course those painters had exaggerated what they saw, inspired to develop their feelings of awe at the sublimity of the subject as they saw it. None of their subjects is disappointing in reality today, but what we see through the lens of a camera or a car windscreen, is sterile. Reality needs a title, because the smell has gone, the spirit is inaudible and the genius has evaporated. Reality is not art. Art is what you do with reality. Turner & others interpreted the monumentality of British landscape because they were unable to travel freely across the European landscapes of Claude and Poussin. Napoleonic Europe had been enemy territory then. Instead the rugged discomforts of northern England would be elevated to Arcadia and imbued with the mythology of history. Turner’s Dunstanburgh Castle is a gaunt tower at dawn standing guard over a rocky shore, or the backdrop to a foundering ship vainly being towed off the rocks by a steamer. His paintings are about poetry and sublimity, not history. In my latest works I have depicted the sediment of history animated by fire and light. Enjoy the exhibition but please don’t bother to read the titles! Not being a person who likes to miss out on a spectacle, I was thrilled to be able to witness at first hand the glorious Pageant on the Thames in London to celebrate The Queen’s Diamond Jubilee. And not being one who enjoys a crowd, I was particularly happy to be able to sketch the event from the deck of the lovely yacht Mariquita (19m gaff cutter by William Fife of 1911), moored just below Tower Bridge. In the days leading up to the Pageant, efforts to get my last-minute security clearance provided a strangely exciting frisson of uncertainty which ensured that the thrill of actually getting on board was an achievement in itself. That and the disappointment of a lousy weather forecast made the odds on my being able to produce a painting of the event fairly unfavourable. With my drawing machine, watercolours and a set of dry clothes I clambered aboard Mariquita at 9.30am. The procession was not due to begin for another six hours. I settled down to sketch my surroundings: downstream the replica of Cabot’s 1497 ship, the Matthew, then TS Royalist, Amazon and Belem. Upstream the three-masted schooner Kathleen & May, then the Jubilee Sailing Trust’s tall ship Tenacious which was moored further into the river. I had been anxious to avoid referring to Canaletto’s concoction of a pageant of 1750’s, a painting which had become the yardstick with which to measure the impact and drama of today’s pageant. Canaletto had been meticulous in his accurate portrayals of architecture but had not been shy of twisting the truth when it suited his composition. I wanted to capture the mood and spirit of the Pageant rather than be bound by documentary precision. When the Pageant had begun and the flotilla’s approach was heralded by the drone of low-flying helicopters beyond Tower Bridge, I began to realise the full complexities of the event. There would be no one moment to record. It was going to be a visual story-board, with hasty glimpses of boats, people, flags and colours, all urgently noted. And rain. 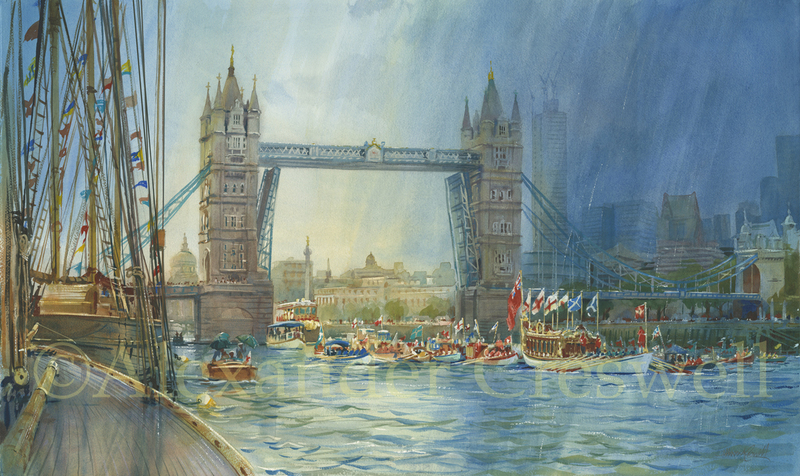 The first boats rounded the corner from the west as a heavy curtain of rain moved in from the east, meeting at Tower Bridge. At the head of the flotilla was an armada of rowers led by the beautiful gilded Queen’s Rowbarge Gloriana. The sight of this phalanx passing beneath Tower Bridge with its bascules as yet unraised, brought a lump to the throat. A mass of small boats; skiffs, canoes, gondolas, dragon boats, fours, gigs, wherries, shallops and surf-boats, all brightly coloured, and flying flags some larger than the boats themselves and with everyone in elaborate costumes. This opening flotilla provided an image so intricate as to be impossible to draw fully in the time it took to pass by, and yet I realised immediately that this was the image I needed to paint. The rain soaked my paper and blurred the vision as I worked feverishly in ink and watercolour. Once again I knew I would have to store all this in my eyes until it was possible to get it down safely on paper. I continued to sketch in wet charcoal on dripping paper. Next came smaller Trinity House launches, naval cadets, escorts and picket boats before the over-festooned prow of the Royal Barge hove into view. This ungainly elongated tripper boat dolled up for the day to carry the royal party – caravan dressed as fairy carriage – drifted slowly beneath the now fully-raised bridge and performed a long and clumsy pirouette mid-river before mooring delicately on the north bank from where the Sovereign would view the passing pageant. I sketched the Dunkirk Little Ships proudly flying the cross of St George, the coal tugs belching steam accompanied by whistles and pips of excitement, the Black Country narrow boats and Cornish fishing luggers which steamed and shantied, gilded slipper launches gliding past in Edwardian elegance, muscular river tugs and workboats rumbling by like thugs off to a football match, aloof MTBs and gunboats sliding past like spooks. A fireboat wailed and squirted water like a clown and a retired ambulance boat nee-naah’d to the amusement of the crowd, while anything that could make a noise was blown or let off and the air wafted with the smell of coal smoke. Orchestras, bands and choirs passed by as it rained harder, but nothing could dilute the sheer pleasure of the spectacle. At the end, a great glass covered bateau-mouche housing the London Philharmonic Orchestra hove to opposite the Royal Barge and played a crescendo medley of ‘Jerusalem’, ‘Land of Hope & Glory’ and ‘Rule Britannia’ as the crowd roared as one in accompaniment, with rain and tears running down their faces. My painting evolved later from my drawings and memory, aided where necessary by the BBC’s footage. The image it represents is not slavishly accurate but it recalls the spirit of the day, a truth of experience rather than actuality. To paraphrase a saying my father enjoyed, “rules serve to guide the wise man and to bind the fool”, I would want to replace ‘rules’ with ‘facts’. Painting is not photo-journalism. I wanted to paint my experience of the day and the pleasure of being there, soaked to the skin.